Augment the look of your conference glass, side lites, and glass partitions while maintaining privacy through distinctive designer / decorative window film and graphics. Add grandeur to your home or office through decorative window film! Microsoft, Boeing, and Expedia use our designer/decorative window film to accentuate their offices, conference rooms, and doors. We provide you with sound proof decorative window film that helps you maintain auditory privacy for meetings and conferences. Designer / decorative window film deters visual, audio intrusion and helps meet HIPAA compliance standards. Glass adds charm to a door, room, or office. Glass also provides some acoustic privacy. However, glass is transparent and hinders your privacy. Get more privacy with privacy window film and add designs to add to the aesthetics to your office. If you need decorative privacy, then privacy window film with distinctive designs is an ideal choice. Whether you have a specific design project, or want your office logo or specific letters on the glass, we can get them designed on the privacy window film. Our installation technicians are experienced with computer cutting technology and can quickly cut the frosted window tinting films to reproduce complex designs. 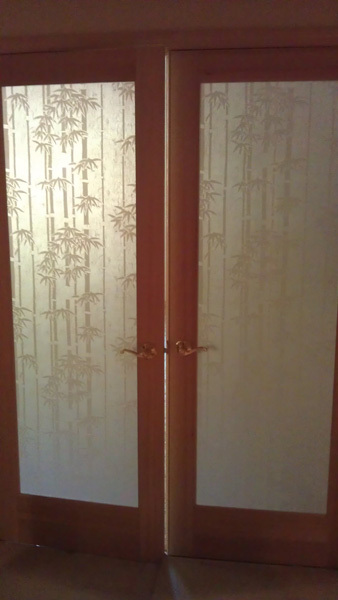 Be it for an individual requirement or for mass production of decorative privacy window film, we deliver elegant privacy window film with the look of classic etched or sand blasted glass at a fraction of the cost. We provide decorative /designer window films and privacy window film for both residential and commercial buildings. ABC Sun Control serves the greater Seattle area and is one of the best window tinting companies in the state!